If a woman wins the Nobel Prize in Physics next week, she will be the first to do so in more than 50 years. Over the same period, just one woman has won in chemistry. This gender imbalance is the subject of increasing criticism, much of which is aimed at the Nobel committees that award the honours. 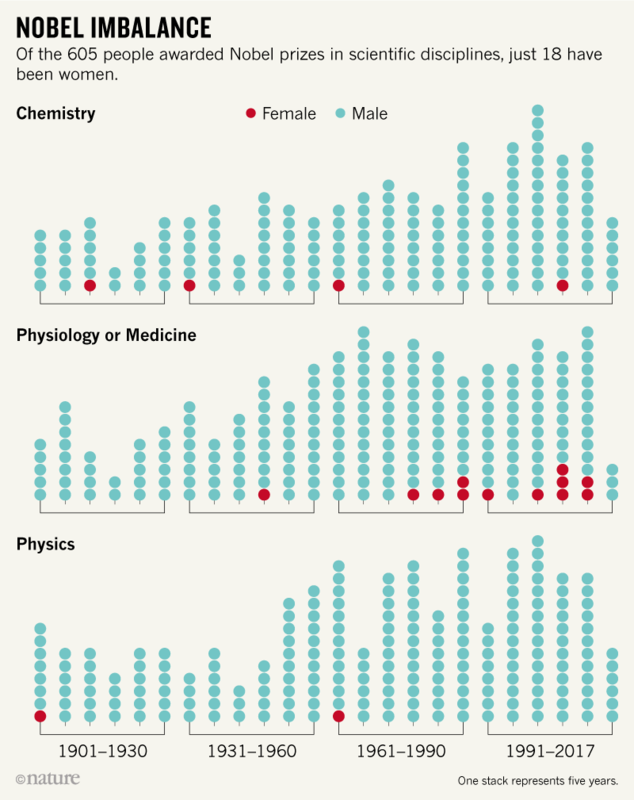 In the awards’ history, women have won only 3% of the science prizes (see ‘Nobel imbalance’), and the overwhelming majority have gone to scientists in Western nations. Some argue simply that the prizes tend to recognize work from an era when the representation of women and non-Western researchers in science was even lower than it is today. But studies repeatedly show that systemic biases remain in the sciences, and the slow pace of progress was especially evident in 2017, when there were no female laureates for the second year in a row. Alfred Nobel laid down the basic rules that govern the prize terms in his will, and statutes based on these guide the awarding of each honour. Winners are chosen by different bodies—the Royal Swedish Academy of Sciences awards the prizes in chemistry, physics and economics, and the Nobel Assembly at the Karolinska Institute in Stockholm awards the physiology or medicine prize—which form a committee for each prize. The committees invite eminent scientists to nominate people, from which they generate a shortlist. Many nominators are dictated by the statutes, by virtue of their academic positions or membership of national academies, but a small fraction are chosen by the bodies themselves. The organizations that award the science prizes have now begun tweaking their nomination processes to encourage gender and geographic diversity among prize nominees and, they hope, winners. But it’s unclear how soon the effects of these efforts will be felt. Göran Hansson, secretary-general of the Royal Swedish Academy of Sciences, says that even now, too few women may be nominated for the prizes. But it’s difficult to know how few are suggested: Hansson declined to disclose the rate at which women are currently nominated, citing the academy’s by-laws, which stipulate that nominations remain confidential for 50 years. For the first time, the committee will explicitly call on nominators to consider diversity in gender, geography and topic for the 2019 prizes. The request will be included in invitation letters scheduled to go out by early October to the thousands of scientists asked to nominate candidates for each prize. “We don’t work in a vacuum. We need the scientific community to see the women scientists, and to nominate those who have made outstanding contributions,” Hansson told Nature. “The smallest possible nudge can make a difference, so I praise them for that,” says Curt Rice, president of Oslo Metropolitan University and head of Norway’s Committee on Gender Balance and Diversity in Research. This approach might lead to greater diversity, because research shows that people make more varied choices when selecting multiple candidates than when they pick just one, says Iris Bohnet, a behavioural economist at Harvard University in Cambridge, Massachusetts. “I’m delighted to hear about the change,” she says. The prize in physiology and medicine already has a better record: women make up 21% of the past decade’s laureates. But the Nobel Assembly remains concerned about gender imbalance, says its secretary-general, Thomas Perlmann. The assembly is increasing the number of women and junior scientists that it invites to nominate, and is continually looking at how it formulates its invitation letter, he says. Rice says that boosting women among nominators—and in the prize-giving bodies themselves, which both organizations have also done—is positive, but unlikely to have much impact because many studies show that, raised with the same cultural biases, both genders tend to favour men. Perlmann, however, says that the assembly has noted that women do have a slightly higher probability of nominating other women. Bohnet and Rice proposed further steps that the academies could take during a February conference on gender convened by the Nobel committees and the Nobel Foundation board. Bohnet suggested that committees could evaluate nominees by comparing them with each other, rather than judging them separately. Her research suggests that this helps evaluators to focus on quality rather than on demographic characteristics, which can reduce bias. To maximize the impact of changes already under way, committees should go further than highlighting that scientists can make multiple nominations; they should require it, adds Rice. Rice notes that gender-equality measures can meet resistance because some people worry that they risk reducing quality. But “the idea that there aren’t high-enough quality women in those fields is ridiculous”, he says. Hansson says that the diversity measures are not about improving the statistics, but about helping the best scientists to win by ensuring that outstanding women are not overlooked. The Nobel Prize necessarily takes a long-term perspective, he says. “We are admittedly slow, but we are aware of the situation and we work on it,” he says. Any suggestion to introduce quotas for minority-ethnic groups and gender would also not be in line with Alfred Nobel’s will, a spokesperson for the Royal Swedish Academy of Sciences told Nature. The academy has no plans to release data on the demographics of nominees, even though studies suggest that increasing public awareness of disparity would encourage change. But if its current measures don’t affect change, the academy will look again at the issue of diversity, says Hansson. Rice says that if the Nobel prizes don’t start better acknowledging the work of women, their reputation will suffer. Other prizes also need to take action, he notes. In mathematics, the Fields Medal was awarded to a woman for the first time in 2014, and the Abel Prize has never been awarded to a woman. “So the whole prize thing has serious problems,” he says. In as-yet unpublished work, Brian Uzzi, a social scientist at Northwestern University in Evanston, Illinois, and his colleagues analysed several scientific prizes and found that in some fields, women have been winning prizes at a rate on a par with their representation. However, those prizes were more likely to be of lower ‘status’ and cash value, and were often related to teaching, rather than research. This article is reproduced with permission and was first published on September 28, 2018.